Paints isolated points in their selected colour but where multiple points in the same layer overlap it adjusts the clour by darkening it. 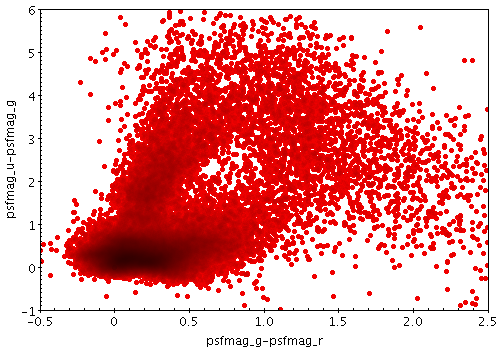 This means that for isolated points (most or all points in a non-crowded plot, or outliers in a crowded plot) it behaves just like flat mode, but it's easy to see where overdense regions lie. This is like density mode, but with no user-configurable options. All the parameters listed here affect only the relevant layer, identified by the suffix N.
The color of plotted data, given by name or as a hexadecimal RGB value. The standard plotting colour names are red, blue, green, grey, magenta, cyan, orange, pink, yellow, black, light_grey, white. However, many other common colour names (too many to list here) are also understood. The list currently contains those colour names understood by most web browsers, from AliceBlue to YellowGreen, listed e.g. in the Extended color keywords section of the CSS3 standard. Alternatively, a six-digit hexadecimal number RRGGBB may be supplied, optionally prefixed by "#" or "0x", giving red, green and blue intensities, e.g. "ff00ff", "#ff00ff" or "0xff00ff" for magenta.